First: NO. No no no no no I do not in any way have dysentery. Except maybe virtually. I’ve been obsessed with playing Oregon Trail lately. A lot. How did I get my hands on this blessed gem? Thanks to the DSiware shop, I was able to download it on my lovely little DSi. And then proceed to forget about all other things going on around me. Well, other than tweeting about the fact that I’ve been playing Oregon Trail. A lot. It’s an updated version of the game for sure. And the features of the DSi have given it a new feel. As is typical with a lot of DS/DSi games, you use the stylus for everything. Definitely makes hunting easier — though that didn’t save me from a few bears and buffalo. Anyway. It’s my new craze. Totally worth the 800 points and the small bit of memory on your DSi. So. 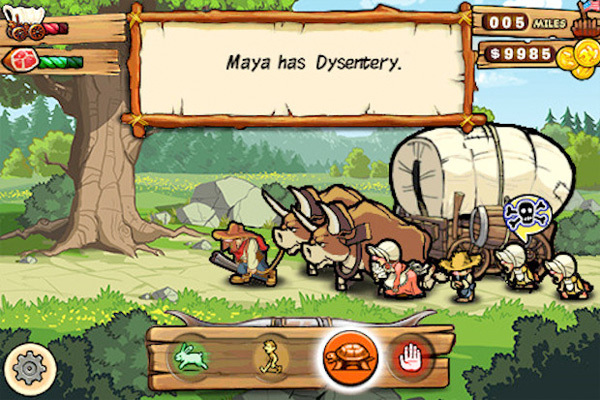 For a little bonus, I decided to name all of my wagon’s party after blogging friends of mine. The first group: Seb, Rachel, Awesome Face/Jenn, Pham and myself. Being that it’d been a while since I’d last played, and the main character is always male, I gave Sebby that title. This meant that outside of a few boots to the head while fishing and a few maulings during hunting, nothing really happened to him. Now, this isn’t fair. So this new trip is being led by Gustuv. A random immigrant farmer who has nothing better to do than lead a (virtual) group of 20-something bloggers out west. Last trip’s highlights: Rachel was kidnapped by an eagle, and later found in a tree; Pham was attacked by at least 2-3 snakes; Awesome Face came down with every type of sickness, and often; and I was attacked by a bear. But we all made it to Oregon. And on time. This trip, Gustuv is leading myself, Nico, Chrissy, and the other Jenn B. So far just a couple broken arms and maybe some cholera. I may or may not post results of this and future games on Pink Dinosaurs.